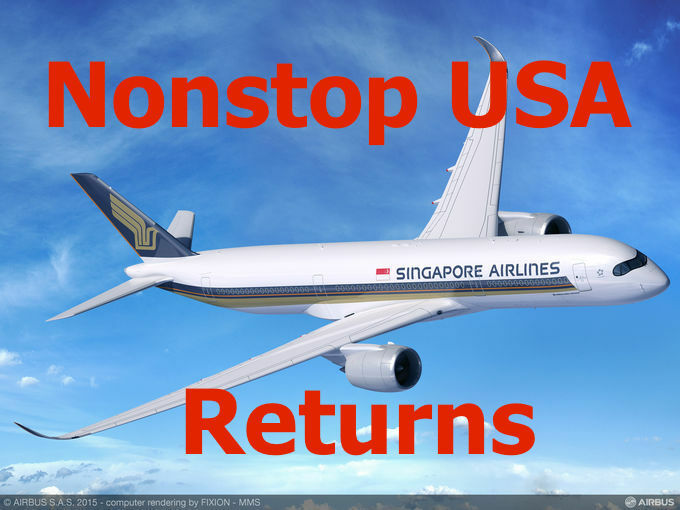 Singapore Airlines has announced a few years back that it would resume non stop flights to the U.S. while placing orders for the new Airbus A350-900 including seven aircraft in ultra long range version. These routes are now resuming in October of this year, five years after the flights have been stopped operating due to bad yields amid high fuel prices with Singapore-New York being the first one. I can still remember that these flights were testing my endurance. I flew the Los Angeles route a few times and the New York Newark route once in Business Class short before it was discontinued. I can’t imagine how it had to be flying this super long haul in Economy Class. You can access Singapore Airlines Press Release here with all information concerning the new flight. The configuration is extremely interesting considering it’s two class only and includes only Business Class and Premium Economy. Singapore Airlines has decided to forego First Class and regular Economy Class on this route for which there are several possible reasons. For one as I mentioned above these flights are extremely exhausting even in Business Class so doing them in regular Economy might be something not many passengers would like to endure and likely decide against booking this connection. First Class would certainly have allure to it for such a long route but the question is if the airline can actually turn enough revenue with First Class. To install one row of First as it’s own cabin they’d have to sacrifice enough space for two rows of Business and that’s hard to justify unless you have a clear case that enough passengers would pay money for it. Not mileage to fly for free – actual cash! The last few flights I took on Los Angeles to Singapore were all barely half full that was Business Class only. Maybe New York has a better yield but since Singapore Airlines is also planning on bringing SIN-LAX-SIN back it appears that SIA is banking on the demand for such direct flights being much greater than in the past including those kind of passengers who are willing to fly in Premium Economy. While I’m generally a fan of Premium Economy products I can’t imagine 18 hours in a PE seat. Last week I had an eleven hour flight from Taipei to Vancouver and that was enough for me. Next articleWhine Wednesdays: Resort Fees For Holiday Resorts & Casino Hotels – Get Rid Of Them!